The m3 is the latest generation of our best selling motorcycle carrier for dirt bikes and scooters weighing up to 500 lbs. Can also be used for light street bikes with rear tire width of 6 inches or less. Everything is Included: We get asked this a lot so here's the deal: MotoTote carriers come with everything you need to haul your bike except for tie downs. We don't include tie downs because you probably have some laying around your garage (make sure they are of good quality). If you can't find those then we'll be glad to sell you some. Loading ramp is included - This is a separate track that you will use to roll the bike up onto the MotoTote. Zero-Wobble hitch bolt is included - We do not sell any anti-rattle collars or other contraptions to eliminate rocking because they are not necessary with MotoTote carriers. The Zero-Wobble bolt eliminates rocking at the hitch. If your MotoTote is rocking then there is an installation problem so please contact us and we'll help you resolve it real quick! Rocking is not a safety issue but it's bad publicity and not nice so let us help you fix it - mK? The MotoTote MTX carriers are built on the MTX Platform which is a large diameter tube beam that provides structural support for all critical components of the motorcycle carrier. Everything is bolted to this platform: Tie-down arms, tire track, wheel chock assembly, etc. This construction provides superior strength and structural integrity. Your mtx m3 product description and documentation link claims a 500lb motorcycle capacity. But your specifications and a recent July 2016 question answe states a 450lb capacity. Another documentation section says carriers made after may 2015 will have a 509lb capacity. So what is correct? And will my order be for the 500lb mtx m3 carrier? Thanks. The weight limit of the current version is 450 lbs. but if you get the upgraded hardware kit HW15 it raises the limit to 500 lbs. By 2017 all MotoTotes will come with the upgraded hardware. Please excuse the unclear documentation. We will be correcting this in the future. Can you still tow a trailer with the MTX m3? You can tow a small trailer by putting a hitch ball in the vertical hole at the end of the square tube. This hole is covered up if you assemble the MotoTote with the tire track at the furthest position from the vehicle. To expose the hole you will need to move the track one hole towards the vehicle. Can you install a hitchball on the bar right side up to attach a small tow dolly behing the bike carrier? Yes! There is a pre-drilled hole for a small hitch ball on the end of the square tube which is normally covered up by the MTX Platform (the big cross beam). To expose the hole you just move the MTX Platform one notch toward the vehicle. The tires are probably a little too wide for the m3 so we recommend the MotoTote Sport for that bike. do you make this for two bikes? I have two electric bikes weighing 125# each. We do not make a two bike carrier at this time. I am trying to determine if my volvo 2013 xc60 would be able to use one of your carriers? I would install the volvo hitch if I had to but am open to other options. thanks for your help! The MotoTote will work with any vehicle that has a class 3 receiver IF you stay within the tongue weight capacity of the vehicle which we consider to be 10% of the towing capacity. So the IF affects the weight of bike that you can carry on your particular vehicle. If the towing capacity of your vehicle is 3500 pounds then you could put 350 pounds on the hitch. The MotoTote weighs 60 pounds so that would leave you a net capacity of 290 pounds for the bike. Yes, you can use an additional front tie-down arm (click) on the back if you need wider spacing of the tie-down loops. This is a popular option for people with similar issues. I read in a review the following: "be aware that the main square tubing that goes into the receiver is drilled for one half inch holes, not five eights". Is that correct? The receiver on my 2015 Winnebago uses a 5/8" pin and I wouldn't want to drill any holes to make this work. That is correct because we use a special bolt called the MotoTote Zero-Wobble Bolt (click) to eliminate play at the receiver. The head of the bolt is the same size as a standard hitch pin (5/8") but the shaft is 7/16" diameter. Here's how it works (click). The MotoTote m3 will work fine for bikes weighing up to 450 lbs. so there would be no reason to go to the MotoTote Sport unless you intend to haul heavier bikes in the future. I have a Honda 230 dirt bike with a wheel base of 80", will it fit on this carrier? Hi Michael, Are you sure it's 80 inches? That would be a LOT. Wheelbase is measured from axle to axle. The MTX m3 will accommodate a wheelbase of up to 65 inches. Please contact us if you need further assistance. Hi there, like your design....am looking for a carrier for an 06 Toyota RAV4. It's going to carry an 09 KTM 530 XCW weighing about 247/50 dry, so wet it'll top the "250 lb" carrier. Suggest I opt for the heavier one? rated at 400 lbs? I also have a concern about this weight on 4 bolted frame mount Class 3 rec hitch. Seems that would be a LOT of stress on the aft 2 bolts(particularly)on the hitch and frame. Experience here? Otherwise, I guess I'm back looking for a light trailer(space restricted!) :-/ Thx! Sorry Marvin, I was eyeing the Addabike carrier too-which is where I got the 250 lb max model-and there ABHD max wt of 400 lbs.? Anyway, I await your answer! Thx. In this case you should be more concerned with the vehicle capacity. Take the total towing capacity and divide by 10 - This is the weight you can put on the hitch. A quick Google search shows 2000 lbs. towing capacity for the RAV4 so you can put up to 200 lbs. on the hitch of which 60 lbs. leaving a net capacity for the bike of 140 lbs. Yes we do from time to time. Just keep an eye on the Deals page. The MTX Sport will work for either bike. Dimensionally the MTX m3 works but the Triumph is over its weight limit of 450 lbs. What is the best carrier for a Cbr250 honda? Bike weights about 370. The MTX m3 will work fine because the rear tire of the CBR250 is less than 6 inches wide and the bike weighs less than 450 lbs. Can I hitch a trailer to the back of this if I am hauling a 325 pound motorcycle? The weight of the loaded trailer would be aprox. 1400 pounds with a tongue weight of about 75 pounds. Are these MTX m3 carriers complient for fitting to a bus? Yes as long as tongue weight capacity of the vehicle is not exceeded. Hi Wayne, Yes the MTX m3 is recommended for use on a motor home and we have many customers that do just that! 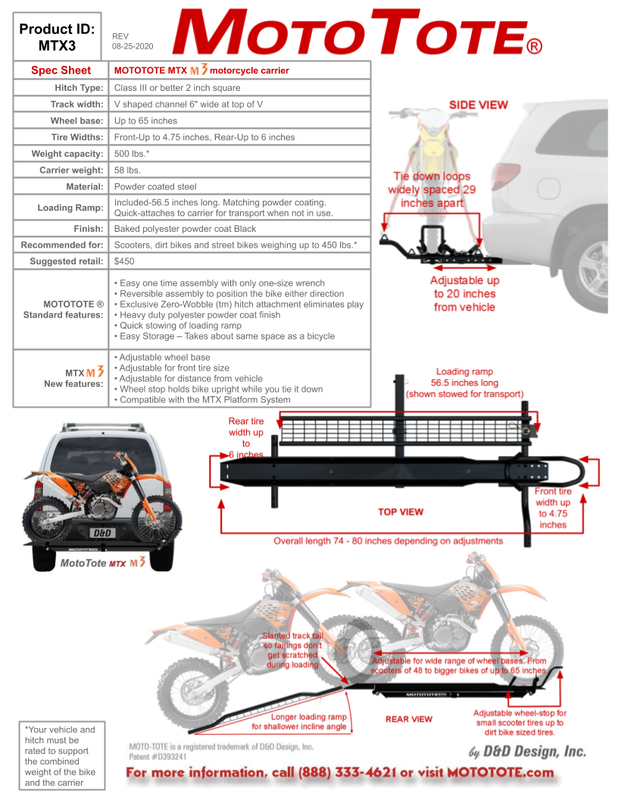 How much does your MotoTote MTX M3 Motorcycle Carrier weigh? The MotoTote MTX m3 weights 58 lbs. Please see the MTX3 Spec Sheet for more details. Hi Dale, That is correct - in most cases it is not an issue. The center line of the bike will be 19 inches horizontally from the hitch pin hole. Vertically the bike tire "foot prints" will be even with the top of the receiver tube. Please see the MTX3 Spec Sheet for more details. is there a class II receiver on the carrier so that you could two a trailer behind it, similar to the Versahauler? There is a hole drilled in the end of the square tube for a hitch ball. The hole diameter accommodates the smaller sized hitch ball for towing a small trailer. Do you sell also Carriers for Trike small electric Bikes total Wt.350 LBS ? I am in need of a carrier to carry 2 gas scooters at one time also that can be modified to have an extended hitch receiver attachment? Hi Marion, We get that question a lot - thanks for asking. You could haul two bikes but you'd need a longer square tube - the one that goes into the hitch. Keep in mind weight capacity would now be shared between the two bikes so it would half the weight limit per bike. For example, if your hitch capacity is 500 lbs. you would need to subtract from that the weight of the double MotoTote: If it weighed 110 lbs. that would leave a net capacity of 390 lbs which would then be split between the two bikes - In this example 195 lbs per bike. We have not done any testing for this so you would be on your own and there would be no warranty coverage. Also, you could add a hitch receiver at the end of the square tube but any weight you add needs to be included in the total and calculated as above. By the time you put two bikes on there I doubt you'd have much weight capacity left for whatever you intend to attach to the added receiver. I have a Vespa GTV 250 with a curb weight of about 400 lbs. Hitch rating 500 lbs. Will the M3 work for me and do I have the capability to center the scooter for weight and location of engine? Yes the MotoTote MTX m3 will work based on those numbers with the important caveat below. Here's the math: Vespa weighs 400 lbs. plus MotoTote 60 lbs. for a total of 460 lbs. This is 40 lbs. under your 500 lbs. hitch rating. 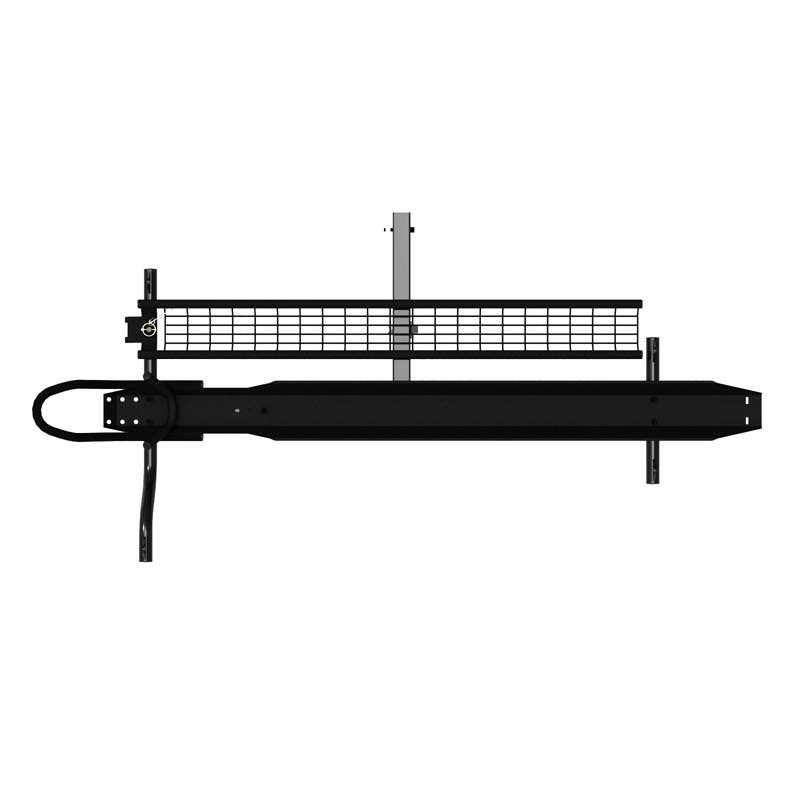 In addition to the capacity of the hitch, you would need the vehicle capacity. I mention this because the vehicle capacity is distinct from the capacity of the hitch itself. So it is possible to have a 500 lbs. capacity hitch on a vehicle that is not rated to carry that much weight. Just imagine welding that 500 lbs. hitch onto the back of a tiny Smart Car (with all due respect to Smart Cars - I like 'em). To verify this capacity, look in the vehicle user manual, find the total towing capacity and divide it by 10. This will be the weight that can be put on the back end of the vehicle safely - in other words the trailer tongue weight that the vehicle must support. For example, if the manufacturer says the vehicle can tow a 5000 lbs. trailer then that means that 10% of that 5000 lbs. potentially might be on the tongue (depending on how the trailer is loaded). So it's unlikely a manufacturer would claim that towing capacity if the vehicle couldn't support the weight of the trailer tongue. Happy MotoToting! looking not sure you can do better got quoted 700 dollars at nice rack not sure you can do better m3 model price in Australian and shipping thanks? Hi Ian, The best place to buy a MotoTote in Australia is NiceRack.com.au because of shipping. You can see shipping cost by adding the item to the shopping cart then use the "Calculate Shipping" section in the shopping cart. Hi David, We conceive, design, develop, and market the MotoTote products here in the US. At this time the actual fabrication of the MTX carriers is done by our exclusive partner in China under our direction. If we did not do this the product would not exist in it's present form (with all the bells and whistles) because it would be so expensive that no one would buy it. Other products in our line such as the light kits are built in the USA. Was this answer helpful? I need something that will carry two scooters. Can this me modified to carry another scooter at the same time? You could but you'd need a longer square tube - the one that goes into the hitch. Keep in mind weight capacity would now be shared between the two bikes so it would half the weight limit per bike. For example, if your hitch capacity is 500 lbs. you would need to subtract from that the weight of the double MotoTote: If it weighed 110 lbs. that would leave a net capacity of 390 lbs which would then be split between the two bikes - In this example 195 lbs per bike. We have not done any testing for this so you would be on your own and there would be no warranty coverage. I am looking to carry at least 2 bikes, so i was wondering if i bought 2 of these if that would be compatible or be able to work? I have a 2004 Dodge Sprinter 2500 and want to haul a Honda Reflex 250 Scooter (375 pounds, 61 inch wheel base). Which of the mototote models is the best match? The MTX m3 would be the best choice for the Dodge Sprinter/Honda Reflex. Here is a link to the spec sheet for the m3. As you can see it will accommodate scooters of up to 450 lbs with wheelbase of up to 65 inches. The m3 was designed with this type of scooter in mind. 2. What does the loading ramp look like? 3. I have an electric bike -- will it work? I have a 1966 Honda Dream that weights 350 pounds and with an overall length of about 77 inches and wheel base of 51 inches. Would the MTX m3 work out ok in terms of the dimensions? Yes, the MTX m3 will work assuming the rear tire is not wider than 6 inches. I have a MotoTote from around 2008 that wobbles a lot. I was hoping to solve the problem by purchasing the anti wobble bolt. However, something doesn't seem right. The hole in the MotoTote seems to be drilled at exactly 5/8 inch (the same as the hole in the receiver), it doesn't appear to be drilled slightly smaller, which is what I expected after reading the description of the anti wobble bolt. So I was wondering if the anti wobble bolt will work for me? Can you please advise me? I would really like to get rid of the wobble! Thanks! The hole was probably drilled out because it should be 7/16". You can drill another hole next to it (at least an inch away) for use with the MotoTote Zero-Wobble bolt. Hi, I just wanted to inquire if the Mototote MTX M3 carrier is the right product i need... I want to load a Vespa LXV150 scooter (253 lbs) on the back of my 2009 Jeep Rubicon unlimited (has a rear spare tire). I plan to get a 2 inch Class III hitch receiver as required. Haven't seen pics in the internet with a scooter loaded on it so I wasn't sure.. I mostly see dirt bikes. Are the tie down ratchet straps included? What else will I need? Thanks. The m3 is designed for scooters as well as dirt bikes. To haul a 253 lbs scooter you will need a (vehicle) tongue weight capacity of 313 lbs. which is the total weight of scooter + MotoTote (60 lbs). So you will need to check the tongue weight capacity of the Jeep. If it's the 4 door Jeep you might be OK but I think the 2 door may be too light on towing. Tongue weight capacity is usually 10% of towing capacity. The only thing not included is tie down straps. You will need 4 (2 pairs). Can these be used on the front receiver hitch of a Mercedes Sprinter 4x4 - 2500? I will be getting an Aluminess front receiver hitch that has a max tongue weight of 350 lbs. I will be adding a small dirt bike for a shuttle vehicle. Ideally an older Honda XR500R that weighs just under 270lbs. I read a post that says the following: "be aware that the main square tubing that goes into the receiver is drilled for one half inch holes, not five eights". Would the MTX3 work with a CURT Class 3 Trailer Hitch #13002? The carrier was everything as expected. Quality. Workmanship, and Marvin was right there with answering a mounting question for moving the carrier closer to the bumper on my 4runner. May not be the cheapest product out there but you do get a quality carrier for the money. Free shipping. Made in USA all worked for me. Also the UTUBE instructions made the assembly simple and fast. I did quite a bit of research before deciding upon the MotoTote. Like pretty much any product, you get what you pay for, and the MotoTote is a rock-solid and safe way to haul your bike around. I work for a motorcycling magazine which requires a constant need to either ride or transport bikes around. I like the ease in which it loads and unloads a bike, and the security of the workmanship. With most other hitch-mounted carriers I've been more than a little nervous about how secure the bike actually was. They'd flop around on the hitch, or a weld might be iffy, etc. As a result I was constantly checking the mirrors, and pulling over to double-check things. Well, the more I use the MotoTote the less that sort of PTSD phenom from past experiences plagues me. I have always believed that you get what you pay for but it is tempting to get cheaper/copies of items at a big discount. I have tried a few carriers and this one is the best so far. Add a hitch clamp and the bike/carrier are solid. Even though MT has pretty good packaging, my carrier came damaged. The made it right and took care of me. The package came quick and box in good condition. As said by some other reviews powder coat dings and scratches is the first things I saw when I opened the box. The powder coat itself isn't the top of the line smooth finish either, but that might be the imperfections of the steel itself. Pointing these factors out just because this product in on the pricey side and when you pay that much you want quality. Besides that it is an amazing carrier and the construction is extremely solid and rigid at the same time its hands down the best looking carrier. Nice looking piece of hardware, fast shipping and quick assembly. Buy together to get the Sale price!